Much too adorable to eat. 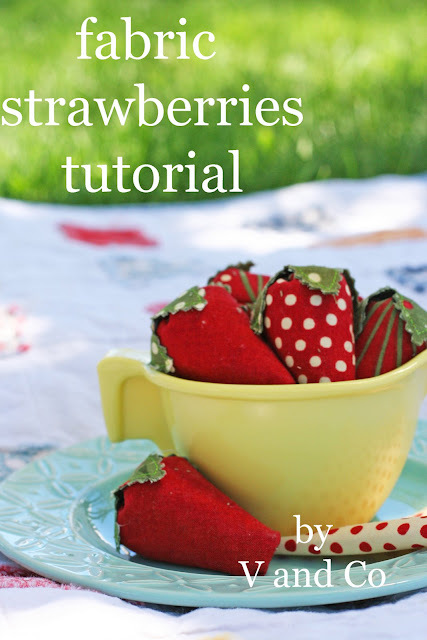 :) Thanks for the tutorial, my daughter loves strawberries and this would be fun to make for her kitchen. Cute in a cup... and so appropriate since strawberries are in season. How smart are you! My cousin sent me the link to these last night; they are adorable! My daughter was ecstatic when she saw this! Adorable. I saw them on MBS this morning. Have a sweet weekend yourself! Those are really cute. Are you going toreally use them as pincushions, or put them in Katie's play kitchen? I have not seen these for years. Love them. I just went to the moda shop and looked over your tutorial. So cute. I can't wait to make mine. My daughter will love them. I love these, thanks for yet another fun tutorial! where do you buy crushed clam shells? Very fun. Thanks for the tutorial. They are so cute. Thanks for the tutorial. Oh my goodness! sew simple, sew cute and sew adorable. Thank you sew much for sharing. ;^) Have a wonderful weekend. Oh, I love your new header!!! You are an amazing artist my friend! I love the photos you put on your blog. It's at least 75% of the appeal!! The other %25 has to do with your spunky blogs, and genuine creativity :) Thanks for sharing your sunshine! Wow, cool new header, although I loved the old one too. This one really reflects you though, and has so much RED! Very cute and fun! Love your new header. Your blog is fabulous. There is an award for you on my blog. V...I love your fabric strawberries! They are sweet! I love the new heading on your blog page. Fun to have the kiddos there. Love, love, love your strawberries! I must make some!!! Those are just adorable! Thanks so much for sharing, I'm off to check out the tutorial! How cute! I am glad that I didn't miss out on those strawberries! These are absolutely adorable. It's on my project list, and my girls can't wait to play with them.